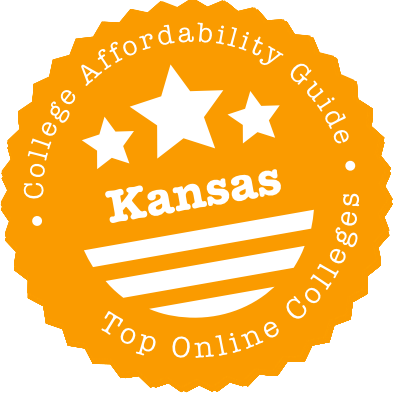 Scroll down to see the top not-for-profit colleges and universities in Kansas offering online degree programs. Fort Hays State University offers more than 40 online degree programs through its virtual college, which is designed specifically for adult students. The University offers an Associate of Applied Science in Applied Technology and an Associate of General Studies that can be completed online. Online bachelor's degrees are available in subjects such as business education, elementary education, health studies, justice studies, management, marketing, nursing, organizational leadership, philosophy, political science and technology leadership. Online master's degrees are available in subjects like business administration, counseling, education, educational administration, instructional technology, liberal studies, professional studies, nursing administration, school psychology and special education. Additionally, online certificate programs are available in 15 subjects, including allied health, geosciences, informatics, justice studies, leadership studies, management and marketing, philosophy, psychology and political science. Some online programs include on-campus requirements, such as the master's program in counseling, which requires a three to four-day on-campus course, and the master's program in school psychology, which includes a five-day on-campus course. The College's virtual college courses are offered in both asynchronous and synchronous formats. Online students at FHSU are eligible for financial aid, including scholarships, grants and loans. Through its global campus, Kansas State University offers online degree programs at the bachelor's, master's and doctoral level. Online bachelor's degree completion programs are available in animal sciences and industry, dietetics, early childhood education, family studies and human services, food science and industry, general business, interdisciplinary social science, nutrition and health, and technology management. Online master's degrees are available in 25 subjects, including education, agribusiness, business administration, chemical engineering, community development, dietetics, food science, gerontology, merchandising, psychology and youth development. The University's only online doctoral degree is a Ph.D. in Personal Financial Planning, which does require 10-day summer intensives on-campus. Additionally, the University offers over 25 online certificate programs, including undergraduate certificates in conflict resolution, food science, nonviolence studies and primary texts, and graduate certificates in adult learning, applied statistics, financial therapy, grassland therapy, horticultural therapy, online course design, public administration and social justice education. Students enrolled in courses through KSU's global campus are eligible for financial aid including many scholarship opportunities. Scholarships available to distance education students include the $1,000 K-State Global Campus Scholarship for Distance Education Students, the $1,000 College of Arts and Sciences Scholarship for Distance Education Students and the $1,000 College of Business Administration Scholarship for Distance Education Students. Emporia State University offers one online undergraduate program and over 20 online graduate programs. The University's online undergraduate program is a Bachelor of Interdisciplinary Studies program in which students are able to design their own major. Online graduate programs are offered in subjects such as accountancy, business administration, curriculum and instruction, educational administration, English, informatics, instructional design and technology, library science, mathematics, physical sciences, special education and teaching. Some of these programs can be completed entirely online, while others have on-campus requirements. The Master of Library Science, for example, requires two weekend-long intensives over the course of the program. The University also offers an online Ph.D. in Library and Information Management that requires two weekend-long intensives. Many online programs, such as the master's program in rehabilitation counseling, require the completion of an in-person internship, although these internships can be completed in a student's local community. Online students are eligible for financial aid, as well as other support services such as tutoring, proctoring, career counseling and technology assistance. Johnson County Community College doesn't advertise any of its myriad programs -116 degree and certificate options - as strictly an online program. However, the school says at least half the requirements for some of its most popular programs can be completed online. Most students say they want to earn an associate degree or certificate, and students can complete a general degree, whether an Associate of Arts for transfer or an Associate of Applied Science for career, with some online courses. Accounting, liberal arts, and fire services administration are among the specific programs with a good number of online options. JCCC also has a four-week winter session where students can complete a class in an accelerated timeframe through online classwork. Barton Community College offers an extensive list of online programs, including associate degree programs for students who want transfer to a four-year school. Potential transfer students can begin their college career majoring in business, education, or humanities. Students intent on gaining job skills can earn an associate in applied science degree or a certificate. Such programs typically are in the fields of business, health care, or public safety. Barton's online classes are delivered in nine-week or 17-week sessions, and spring and fall semesters have two nine-week sessions available. The college never cancels an online class due to small enrollment. With more than 250 courses online, Hutchinson Community College makes it possible for students to complete all the work necessary for an associate degree or certificate online. Students who want to transfer to a four-year school can get a head start on their education by taking the first two years at Hutchinson and earning an Associate of Arts or Associate of Science degree. Career associate degrees are also available online in subjects such as business administrative technology, paralegal, and criminal justice. Online certificates in various fields, including business and health care, are also available. Most courses are delivered in a format that allows students to study when and where they want, but some courses may require proctored exams. The College of Liberal Arts & Sciences has a BGS, Degree Completion Program for students with 60 or more credit hours. The School of Health Professionals offers a BS in Respiratory Care for RRTs to earn their bachelor's degree online. Thirteen graduate degrees are available from the following six KU schools - Business, Education, Health Professions, Nursing, Pharmacy and Social Welfare. The School of Nursing and the School of Education also offer online graduate certificates. KU Continuing Education offers non-credit courses and certificates in Biosciences, Fire & Rescue, Law Enforcement and other fields of specializations. KU online education uses the Blackboard learning management system. Highland Community College offers a range of associate degrees for online students. Individuals who want to transfer to a four-year school can earn an Associate in Arts, Associate in Science, or Associate in General Studies degree and take advantage of the seamless transfer policy among Kansas schools by transferring to a college or university in state. HCC also has several online programs designed for students who want gain career skills to use immediately. Associate in Applied Science degrees are available in fields including accounting, medical coding, and personal fitness trainer. Online programs in risk management lead to a certificate or an associate degree. Southwestern College offers an extensive list of undergraduate and graduate degrees, as well as certificates at both levels, that adult learners can earn in a flexible, online environment. Students can use a prior learning portfolio to gain academic credit for learning acquired through military training, work training, or life experience. Students may also earn credit by taking an exam. Undergrads can earn a bachelor's degree in subjects including accounting, business administration, quality management, human resources, operations management, strategic leadership, early childhood or elementary education, health care administration, nursing, psychology, Christian ministries, criminal justice, security management, computer programming, or information systems management. Graduate degrees are offered in leadership, management, business administration, security administration, curriculum and instruction, special education, teaching, and specialized ministries. The college also has an online Doctorate of Education with tracks in PK-12 and higher education. Most of the certificates offered are in the fields of business or security. Classes are delivered in six-week terms, and the college has eight terms per year. New students can enter the program at the start of any term. Online students at Central Christian College of Kansas can choose from two associate programs and five bachelor's degrees that can be completed entirely online. The online Associate of Arts degree is designed to be flexible for working adults, allowing students to take courses in a variety of subjects, which can enhance critical thinking. Online students also develop writing and computer skills that can be valuable on the job. Online bachelor's programs include health care administration, business administration, and criminal justice. Textbooks, typically e-books, are included in the cost of tuition, and all classes use an asynchronous format that allows students to log in and work at the time that best fits their schedule. A large portion of students at Kansas City Community College take at least some of their coursework online. The largest percentage of KCCC students earn a certificate, and the college offers dozens of certificates in everything from addiction counseling to web design. The college also has a range of associate degrees, including transfer degrees for students who want to earn a bachelor's degree and Associate of Applied Science degrees for students preparing to enter or advance in the workforce. Most KCCC online courses allow students to access content 24/7, but they must log in regularly and meet weekly due dates on assignments. The college has transfer agreements with about 30 schools. Through Wichita State Online, undergraduate students can pursue any one of the following degrees: an Associate of Arts degree, four Bachelor of General Studies degrees, three Bachelor of Arts Field Majors and a Bachelor of Science in Criminal Justice. In addition, there are four graduate programs that can be completed online: MA Aging Studies, MA Criminal Justice, Master of Education, and MSN to DNP (Doctor of Nursing Practice). Wichita State Online enables instructors and students to communicate and collaborate online through the Blackboard learning management system. Washburn University has developed bachelor degree completion programs that it offers through the Partnership for Learning and Networking (PLAN). Applicants are required to have an associate's degree in a related field from a recognized partner institution, such as a junior college or a technical school. When accepted to any of the programs, they can earn their bachelor's degree entirely online. At the current time, there are five degree programs available through PLAN: Bachelor of Health Science, Bachelor of Integrated Studies, Bachelor of Applied Science in Human Services, Bachelor of Applied Science in Technology Administration, and Bachelor of Science in Criminal Justice. Students accepted to the Bachelor of Health Science program can choose from the following three majors: health services administration, medical imaging, and clinical laboratory science. The Bachelor of Science in Criminal Justice degree offers the following areas of concentration: law enforcement, corrections, and security administration. Online certificate programs are also available from the Allied Health Department of the School of Applied Studies. There are four such certificates currently being offered in the following fields: diagnostic medical sonography, magnetic resonance imaging, health information technology, and radiation therapy. These certificate programs can either be completed entirely online or have significant online components. Pittsburg State University offers more than 40 online degree programs, including bachelor's, master's and education specialist degrees. Several certificates for teachers are also offered through online programs. Many of the degrees are in the field of education, including master's degrees in special education, ESOL, elementary education, reading, and educational technology. The Ed.S. degrees are advanced studies in general school administration and special education. Pittsburg State also offers a variety of programs leading to a Master's in Engineering Technology, with emphasis areas including construction, electronics, manufacturing, mechanical, and plastics. Master of Science in Technology options include innovation engineering, technology management, automotive technology, graphic design, and construction management. MBAs are offered in accounting, general administration, and international business. Students in the Master of Science in Health, Human Performance and Recreation program can earn a degree with an emphasis in human performance and wellness or sport and leisure service management. Part-time students - those taking 8 or fewer graduate credits or 9 or fewer undergrad credits - working toward a degree online may qualify for in-state tuition no matter where they live. Students at Allen Community College can earn associate degrees in a wide variety of subjects through online learning. (The college uses the online designation for any program where at least half the classes are available online, but some programs are 100 percent online.) Degrees available through online coursework included early childhood education and criminal justice. Many Allen students earn an associate degree online and transfer the credits to a four-year school to complete their bachelor's degree. The college also offers some online certificate programs for students who need job skills and don't want to take the general studies courses required in a degree program. Online students can receive tech support via email from Allen Community College. Baker College says that more than nine out of 10 students who begin an online degree program with the School of Professional and Graduates Studies complete their degree. Students can enter the online program at multiple points throughout the year, and classes run from six to eight weeks in length, allowing students to take one course at a time and still make timely progress toward completion. Classes are asynchronous so students can access the material when it best fits into their schedules. Online programs leading to a degree for adult learners include Associate of Arts in Business, Bachelor of Science in Criminal Justice, and Bachelor of Business Administration with majors in business leadership, management, and strategic business communication. Graduate students can enroll in an online program leading to a Master of Arts in Organizational Leadership, Master of Liberal Arts, MBA, or Master of Science in Nursing. The School of Professional and Graduates Studies also offers online professional development and recertification programs for teachers and graduate certificates in health care administration, human resources, and finance. MidAmerica Nazarene University has online programs leading to associate, bachelor's, and master's degrees in the fields of business, nursing, and education. Business students have three options. The accelerated Associate of Arts in Business can be completed in 18 to 20 months. The online Bachelor of Business Administration is a degree-completion program that requires applicants to have at least 45 college credits they can transfer. MidAmerica Nazarene uses a cohort model for its MBA program, and students complete the degree in 24 months. Nursing programs include RN to BSN, RN to MSN, and a standalone Master of Science in Nursing for applicants who already have a BSN. Educators can advance their career by earning a Master's in Education and choosing a track in reading specialist, ESOL, or technology enhanced teaching. Applicants to the master's programs should have an undergraduate GPA of a least 3.0, and teachers and nurses must have a valid license. Start dates vary by program, and some classes require students to attend live webcasts and use virtual collaboration tools. Call it the land of distance learning! EDUKAN, 2+2 degrees, Great Plains IDEA—the state is peppered with online initiatives that can help you save money. In our quick guide to choosing an online program in Kansas, you’ll find info & links on everything from virtual high schools to tuition discounts with MSEP. We also profile a) regionally accredited schools that are truly affordable and b) schools with accreditation or quality concerns. EDUKAN is a consortium of six Kansas community colleges that have banded together to offer online undergraduate programs and online certificates. The six members include Barton Community College, Colby Community College, Dodge City Community College, Garden City Community College, Pratt Community College, and Seward County Community College. EDUKAN’s online degrees are AS, AA, AGS, and AAS programs. These can be used as the first two years of a bachelor’s degree. EDUKAN’s online certificates are primarily skills-based (e.g. surgical technology). To help folks get that prized bachelor’s degree, EDUKAN has partnerships with both Fort Hays State University and Kansas State University. Students can complete their General Education credits online with EDUKAN and finish their undergraduate education at a state university. Tuition for all EDUKAN courses, regardless of Kansas residency status, is set at a fixed low rate. Financial aid is also available. The website has instructions on how to apply online, as well as guidance on transferring existing credits (e.g. military service school credit). 2+2 programs are designed for working professionals, parents, and students who need flexibility. In a typical 2+2 program, students earn an associate’s degree at their local community or technical college and finish the last two years of their bachelor’s degree at a university. A lot of public universities in Kansas—including FHSU, K-State, PSU, and Washburn—have 2+2 and degree completion programs that allow you to complete your junior and senior years online. Thinking about programs beyond the Kansas state line? Kansas is part of the Midwestern Higher Education Compact (MHEC), which runs a reduced tuition student exchange program called the Midwest Student Exchange Program (MSEP). Kansas students enrolling as non-residents in certain programs at MSEP campuses may be eligible for a tuition discount. This discount equals no more than 150% of the in-state resident tuition rate at public institutions or a 10% reduction on tuition rates at private institutions. The MSEP homepage allows you to search for qualifying programs by state, degree level, and/or type of school. To earn the title of an Affordable Online School, the following Kansas universities had to meet some tough criteria for quality, flexibility, price, and use of financial aid money. (You’ll see a CAG score next to their profile in our ranking). For data on a school’s graduation rates, average debt loads, and more, check out the statistics on College Scorecard. ESU’s website on Distance Education is packed with info on its online undergraduate and graduate programs, including details about free online tutoring through the SMARTHINKING Online Tutoring program. There’s an entire section on tuition & fees, with details about tuition discounts for MSEP students. Even better, ESU offers a special Corky Plus Tuition (in-state tuition rates) to students in certain Missouri and Oklahoma counties. Financial aid is also available. If you’re looking at quality markers, ESU often ranks in the Top 100 of U.S. News & World Report rankings for Best Online Graduate Education Programs and Best Online Graduate Business Programs (Excluding MBA). In addition to master’s degrees in teaching & education, ESU has developed a number of online graduate licensure & certificate programs for educators. K-State’s Global Campus has the full rundown of its online degrees and certificates, as well as its non-credit professional development courses. Online and off-campus courses in the Global Campus are charged at a fixed tuition rate, regardless of residency status and a number of scholarships are available to distance education students. As a charter Servicemembers Opportunity College (SOC) member, K-State also provides many military benefits to distance learners. As we mentioned, K-State is an EDUKAN partner and has a number of 2+2 programs with community colleges & technical colleges, including some schools outside of Kansas. If you’re thinking of a human sciences or agricultural degree, it’s worth knowing that K-State is member of the Great Plains Interactive Distance Education Alliance (IDEA). Students in Great Plains IDEA programs pay a special Great Plains IDEA Common Price per credit hour. Finally, we wanted to note that U.S. News & World Report rankings for K-State’s online programs are very good, especially in science & technology. In 2018, it was in the Top 25 of Best Online Graduate Computer IT Programs, the Top 35 of Best Online Graduate Engineering Programs, and the Top 50 of Best Online MBA Programs and Best Online Graduate Education Programs. Be sure your Kansas school is fully accredited by an organization recognized by the U.S. Department of Education. National accreditation may apply to distance learning institutions (including for-profits), but regional accreditation is the gold standard—especially if you’re trying to transfer credits or seek financial aid. The Higher Learning Commission (HLC) (formerly the North Central Association of Colleges and Schools) is in charge of regional accreditation for Kansas universities and community colleges. It’s simple to search for HLC-accredited institutions by state. If you’re also considering out-of-state options, you can check any institution’s regional or national accreditation status using the Council for Higher Education Accreditation (CHEA) Database. Kansas is relatively lucky—states like California have a much bigger problem with bogus schools and diploma mills. As of 2016, the following schools are all regionally accredited, but we did want to highlight some quality concerns. Bethany College is regionally accredited, but it was placed On Probation by the HLC in June 2015 because it was no longer in compliance with a number of criteria for accreditation. HLC had concerns with financial stability and other resources—according to the Hutchinson News, the college had been running deficits for the past eight years. This Probation period lasts for two years and the institution remains regionally accredited while it addresses problems. On the plus side, College Scorecard reports that Bethany College has fairly stable student statistics. CCC is regionally accredited, but it was placed On Probation by the HLC in June 2015. HLC had a number of concerns related to retention, persistence & completion rates, as well as resources, planning, and systematic improvement. This Probation period lasts for two years and the institution remains regionally accredited while it tackles the issues. However, College Scorecard reports that CCC has fairly stable student statistics. NAU is a for-profit university based in South Dakota with multiple campuses around the U.S. It is regionally accredited by the HLC. However, College Scorecard reports that the Overland Park campus has a low graduation rate and lower than average percentage of students who have started paying down their debt within three years. Graduation rate data are not available for the Wichita campus; this campus has similar debt statistics to Overland Park. Higher Learning Commission (HLC): Formerly known as the North Central Association of Colleges and Schools, HLC is the regional accreditation body for universities and community colleges in Kansas. Use its website to search for HLC-accredited institutions by state. Kansas Association for Interactive Distance Education (KAIDE): KAIDE is a group of Kansas organizations that support interactive distance education efforts in schools, education service centers, and state agencies. Kansas Connections Academy (KCA): Created in partnership with Elkhart USD 218, KCA is a tuition-free, online public school serving students in grades K-12. Kansas Online Learning Program: Like KCA, KOLP is a tuition-free, online public school (K-12) open to all Kansas residents and run by the USD 397 Centre School District. Adult learners who want to earn their high school diploma are welcome. EDUKAN: Use this website to search for online undergraduate programs and online certificates offered by a consortium of six Kansas community colleges—Barton Community College, Colby Community College, Dodge City Community College, Garden City Community College, Pratt Community College, and Seward County Community College.